It’s with great pleasure that I can once again announce the fourth annual Bomberblitz BBQ! THURSDAY 21ST FEBRUARY 2019 (yes it’s a Thursday this time). Training kicks off at 10am. Basically it’s a small(ish) gathering where we borrow the third floor balcony, chat all things Essendon (we’ve had a mod attend every year so you can still be banned! 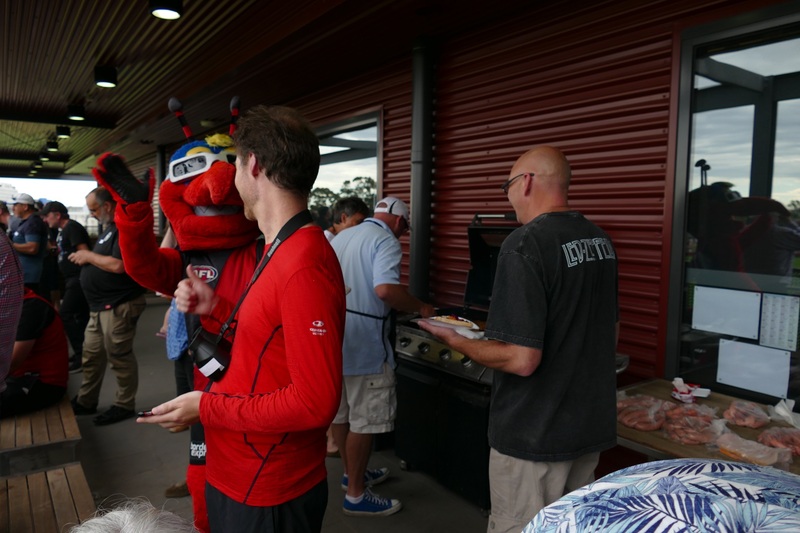 ), watch an intra club match and enjoy the smells and taste of a BBQ. If you thought hot chips were good at the football, wait till you watch having a sausage on bread. I’d like to attend, do I need to do anything special? Please PM Hoffy your name and a contact number so I can keep track of who is attending and also pass on the names to the club if needed. We don’t anticipate someone doing something silly but it’s good to make sure. Feel free bring along your family. I’ll also be making name tags again to make life easier as well. No. However the last couple of occasions nearly everyone attended brought something along. If you want to bring something please post it here so I can update the list. If you say you’ll bring something but suddenly can’t attend please PM Hoffy (PMing Mendozza in this case won’t do you much good) as soon as possible so we can make other arrangements, particular if you bring something important like bread! Vegans are welcome. Let me know on the day so we can cook your stuff early so as not to mix up any of the oils / fat from the sausages. Some sun protection would be advised. Sun shines directly on the balcony at that time of day. We’ve been burnt a few times. I’ve copied the list from the last bbq so we don’t forget anything. Nothing is mandatory! Those name in brackets have confirmed what they are bringing. PLEASE SEE UPDATED POST FROM HOFFY BELOW! Anything else you’d like to contribute. No. This is strictly a no alcohol event. You can drink later, but off the premises. I’m not sure if the bombershop is open or if we’ll be able to arrange a tour for those who haven’t been on a tour yet. I’ll let you know when I can confirm. If you are interested in a tour please let me know early so I can have this arranged. Have a look at last year’s event then. I’m interstate or overseas, can I attend? Yes. Tullamarine airport is just next door. Pretty much anyone associated with the club. Huge thanks again to Katie for forwarding my request to the right people! We like nice things so ask those who attend to be well behaved. Please don’t disgrace yourself, bomberblitz or the club. Thanks for reading and hope you can attend! It’s with great pleasure that I can once again announce the third annual Bomberblitz BBQ! Sadly I won’t be able to make this day as we actually are having an offsite. Have fun all! Until next time! Some excuses for those who need it. Have a great time all. Look forward to the pics! Unfortunately it’s a no for this one, but I reckon Bomberblitz 5th BBQ could be a goer. Day off requested, and approved. Yay! Thank you for organising this Mr Net. I can’t make it so could someone please eat a sausage with onion on top for me? So… the question is… are you coming? I presume that last question was directed to me, so the answer is Yes, I will be there!! Who organises holidays without confirming with blitz first?